Note: A minimum of 12 items is required for printing on most products. Items For Resale: Reseller certification may be required. Monday through Friday 8AM to 5PM E.S.T. Safetysmartgear.com can provide custom printing on most high visibility clothing, hardhats, safety glasses as well as some types of hearing protection. From multi color custom logos to text in just about any font. Our customer service department is available from 8AM to 5 PM Monday through Friday to ensure your printing order is done accurately and as quickly as possible. Heat Press Printing is cost effective, provides a smooth graphic and tends to have a faster turnaround than some silk screen printing jobs. It is especially cost effective for smaller, short run quantity print jobs. Heat press text and images are created with CAD software then precisely cut from a Polyurethane or PVC film, heated, then pressed into the fabric. Each color requires a different image to be created as colors are applied separately. 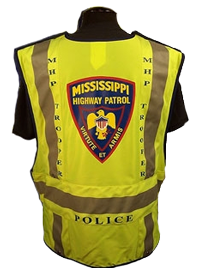 This method lends itself well to printing on high visibility clothing which is usually made from polyester. Screen Printing is done by creating the image or images using a fine screen. Separate screens are used for each color. These screens are porous where the image needs to be transferred and non-porous where no ink is needed. Screens are placed over the area of the garment that requires the ink to be applied and squeegeed onto the clothing. Screen printing is more cost effective when used in larger run print jobs as it is slightly more labor intensive than the heat transfer printing method. The ink is transferred into the high visibility fabric providing a precise and well bonded transfer of the graphic. Turnaround times for custom printing may vary depending on several factors. Seasonal demand, number of products in the print run and the complexity of printed graphics may all play a part in the speed at which your order is completed and shipped. The average turnaround time for custom printing is 2 weeks although this can vary either way depending on the aforementioned factors. Because all types of printing need the proper graphic files, we require the graphic to be in a vector format for custom logo printing. In the case of basic text printing no vector file is required as we create the text for you. For images a vector file is required. Basically, a vector format is a graphic file that uses the outline on an image. These types of files are also used by sign, stationary and truck lettering companies. If you have ever had any of this type of printing done you may have access to the vector files we require for images. We can convert other types of files if you do not have vector images, however there is an additional fee to cover the cost of the file conversion. If your images are in .jpg, .bmp or gif there will more than likely be a charge to convert them. Some of the most common vector files are .AI (Adobe Illustrator), .CDR (CorelDRAW), .eps (Encapsulated PostScript) and sometimes .pdf (Portable Document Format). Safety Smart Gear also offer big discounts on pricing for large quantity orders. Visit the Large Quantity Quote page for more information.